We know it’s easy to hit the local big-box store or boutique to find furnishings and accoutrements to embellish your outdoor space; and, it’s always nice to have fresh, new things. But add in a few vintage finds—like gently-aged iron urns, old concrete figures, even a rustic bench or wagon wheel—and you instantly create a sense of history that gives your garden, deck or patio interest. Mixing old with new can create style and whimsy, plus, it’s easy on your budget. Collect a set of colorful, mismatched china and silverware, and reserve them for outdoor gatherings. Add a few vintage, metal or wicker chairs to complement your newer set for patio or backyard seasonal seating. Bring pillows and linens outside for the day or an evening gathering. Arrange fresh flowers in vintage vessels or drop in small potted flowers. The more you look at your outdoor space as a second living room and let your creativity flow, the more fun you’ll have sharing it with friends and family—or enjoying your personal oasis. To get you started, here are our 17 tips for vintage outdoor decor, from how to arrange your finds to how to care for them. 1. 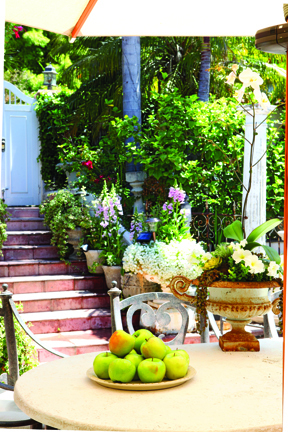 Use vintage textiles, pillows and embellishments on chairs and tables to dress up the outdoors for the day. 2. A beyond-repair chair can be found for cheap and repainted for garden art or a plant stand. 3. 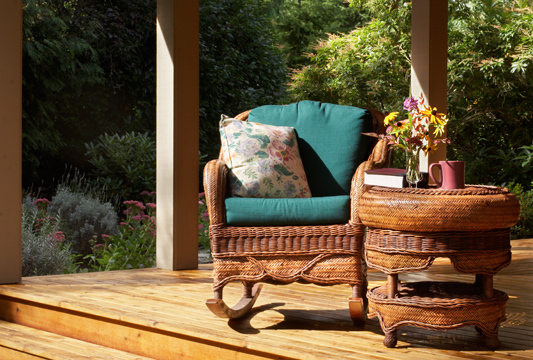 Create an inviting outdoor nook with just a few elements, like an old bench and fresh-cut flowers. 4. A “new” greenhouse getaway uses old doors and windows for the roof and walls. Reclaimed bricks make a perfect floor. 5. 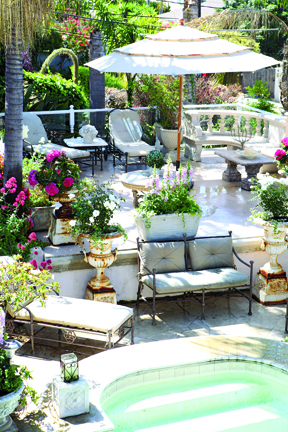 Backyard structures benefit from flea market finds, including vintage-style fittings and embellishments like old china mosaic trim, ironwork and more. 6. A chandelier or old window can find new life as seasonal garden adornments hung from a tree or pergola. 7. 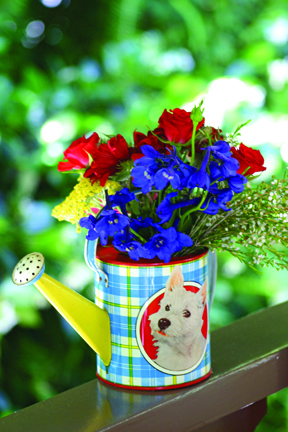 From new buckets and vintage tins to chipped crockery, fill them with cut or potted plants. 8. Create vignettes with a mix of vintage finds, flowerpots or window boxes with newer ones. 9. Weathered, classically-styled urns filled with flowering greenery give a timeless feel and add sculptural magic to outdoor spaces. 10. Timeless features, like a sundial, add a sense of history to your outdoor living spaces. 11. 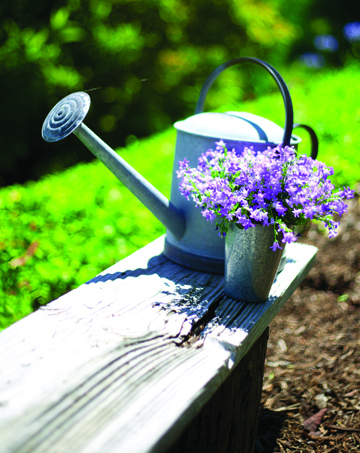 Employ aged, galvanized tin watering cans instead of new plastic ones, or use them to create an interesting border. We love the rustic look of weathered finds, but it doesn’t take long for even new piece to look tired. For certain pieces, simply allow them to age naturally. But for others, you may want to follow these tips to keep the old and the new looking great for as long as you can. 12. Built-up dust and dirt can damage pieces. Periodically clean items with soap, water, and a sponge or rag; then gently rinse with a spray from your garden hose. 13. Consider painting wood to lessen UV damage. You’ll need to reapply every few years. 14. To avoid water damage from below, keep wood benches, tables, etc., off lawns for long periods of time. 15. Spray a clear sealant on wood, metal or wicker. 16. Use furniture covers or bring pieces into the garage or under awnings when weather turns. To avoid mildew, store pillows and cushions inside and if washing, always dry thoroughly. 17. Apply a spray protector such as Scotchgard to seat cushions; consider using marine-grade canvas or outdoor fabrics for outdoor upholstery. This entry was posted in Decor Inspiration and tagged architectural salvage, chandelier, garden, greenhouse, mosaic, outdoor, tin watering can, vintage by Flea Market Decor. Bookmark the permalink.